But science sets out confidently on the endeavor finally to know the thing in itself, and even though we realize that this ideal goal can never be completely reached, still we struggle on towards it untiringly. 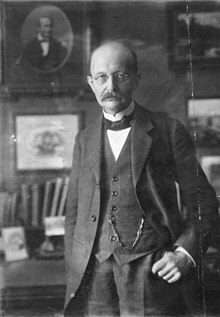 Max Karl Ernst Ludwig Planck (23 April 1858 – 4 October 1947) is the originator of modern quantum theories and one of the most important German physicists of the late 19th and early 20th centuries, winning the Nobel Prize in Physics in 1918. Wissenschaftliche Selbstbiographie. Mit einem Bildnis und der von Max von Laue gehaltenen Traueransprache. Johann Ambrosius Barth Verlag (Leipzig 1948), p. 22, as translated in Scientific Autobiography and Other Papers, trans. F. Gaynor (New York, 1949), pp. 33–34 (as cited in T. S. Kuhn, The Structure of Scientific Revolutions). Die Wahrheit triumphiert nie, ihre Gegner sterben nur aus. Truth never triumphs—its opponents just die out. Farsighted theologians are now working to mine the eternal metal from the teachings of Jesus and to forge it for all time. But science sets out confidently on the endeavor finally to know the thing in itself, and even though we realize that this ideal goal can never be completely reached, still we struggle on towards it untiringly. And we know that at every step of the way each effort will be richly rewarded. In other words, the fundamental principles and indispensable postulates of every genuinely productive science are not based on pure logic but rather on the metaphysical hypothesis – which no rules of logic can refute – that there exists an outer world which is entirely independent of ourselves. It is only through the immediate dictate of our consciousness that we know that this world exists. And that consciousness may to a certain degree be called a special sense. The first and most important quality of all scientific ways of thinking must be the clear distinction between the outer object of observation and the subjective nature of the observer. Experimenters are the schocktroops of science… An experiment is a question which science poses to Nature, and a measurement is the recording of Nature’s answer. But before an experiment can be performed, it must be planned – the question to nature must be formulated before being posed. Before the result of a measurement can be used, it must be interpreted – Nature’s answer must be understood properly. These two tasks are those of theorists, who find himself always more and more dependent on the tools of abstract mathematics. We have no right to assume that any physical laws exist, or if they have existed up to now, that they will continue to exist in a similar manner in the future. Interview in 'The Observer', 25 January 1931, p.17, column 3. Anybody who has been seriously engaged in scientific work of any kind realizes that over the entrance to the gates of the temple of science are written the words: Ye must have faith. It is a quality which the scientist cannot dispense with. Again and again the imaginary plan on which one attempts to build up that order breaks down and then we must try another. This imaginative vision and faith in the ultimate success are indispensable. The pure rationalist has no place here. Science cannot solve the ultimate mystery of nature, for in the final analysis we ourselves are part of the mystery we are trying to solve. Als Physiker, der sein ganzes Leben der nüchternen Wissenschaft, der Erforschung der Materie widmete, bin ich sicher von dem Verdacht frei, für einen Schwarmgeist gehalten zu werden. Und so sage ich nach meinen Erforschungen des Atoms dieses: Es gibt keine Materie an sich. Alle Materie entsteht und besteht nur durch eine Kraft, welche die Atomteilchen in Schwingung bringt und sie zum winzigsten Sonnensystem des Alls zusammenhält. Da es im ganzen Weltall aber weder eine intelligente Kraft noch eine ewige Kraft gibt—es ist der Menschheit nicht gelungen, das heißersehnte Perpetuum mobile zu erfinden—so müssen wir hinter dieser Kraft einen bewußten intelligenten Geist annehmen. Dieser Geist ist der Urgrund aller Materie. As a man who has devoted his whole life to the most clearheaded science, to the study of matter, I can tell you as a result of my research about the atoms this much: There is no matter as such! All matter originates and exists only by virtue of a force which brings the particles of an atom to vibration and holds this most minute solar system of the atom together. . . . We must assume behind this force the existence of a conscious and intelligent Spirit. This Spirit is the matrix of all matter. Das Wesen der Materie [The Nature of Matter], a 1944 speech in Florence, Italy, Archiv zur Geschichte der Max‑Planck‑Gesellschaft, Abt. Va, Rep. 11 Planck, Nr. 1797; the German original is as quoted in The Spontaneous Healing of Belief (2008) by Gregg Braden, p. 212; Braden mistranslates intelligenten Geist as "intelligent Mind", which is an obvious tautology. Under these conditions it is no wonder, that the movement of atheists, which declares religion to be just a deliberate illusion, invented by power-seeking priests, and which has for the pious belief in a higher Power nothing but words of mockery, eagerly makes use of progressive scientific knowledge and in a presumed unity with it, expands in an ever faster pace its disintegrating action on all nations of the earth and on all social levels. I do not need to explain in any more detail that after its victory not only all the most precious treasures of our culture would vanish, but — which is even worse — also any prospects at a better future. It [science] has as its highest principle and most coveted aim the solution of the problem to condense all natural phenomena which have been observed and are still to be observed into one simple principle, that allows the computation of past and more especially of future processes from present ones. ...Amid the more or less general laws which mark the achievements of physical science during the course of the last centuries, the principle of least action is perhaps that which, as regards form and content, may claim to come nearest to that ideal final aim of theoretical research. As quoted by Morris Kline, Mathematics and the Physical World (1959) Ch. 25: From Calculus to Cosmic Planning, pp. 441–42. Experiments are the only means of knowledge at our disposal. The rest is poetry, imagination. That God existed before there were human beings on Earth, that He holds the entire world, believers and non-believers, in His omnipotent hand for eternity, and that He will remain enthroned on a level inaccessible to human comprehension long after the Earth and everything that is on it has gone to ruins; those who profess this faith and who, inspired by it, in veneration and complete confidence, feel secure from the dangers of life under protection of the Almighty, only those may number themselves among the truly religious. Only that definite and clear instruction which we gain can form a direct inner link to God. This instruction alone is able to give us the inner firmness and lasting peace of mind which must be regarded as the highest boon in life. Religion and natural science are fighting a joint battle in an incessant, never relaxing crusade against scepticism and against dogmatism, against disbelief and against superstition, and the rallying cry in this crusade has always been, and always will be: "On to God!" Both religion and science need for their activities the belief in God, and moreover God stands for the former in the beginning, and for the latter at the end of the whole thinking. For the former, God represents the basis, for the latter – the crown of any reasoning concerning the world-view. While both religion and natural science require a belief in God for their activities, to the former He is the starting point, to the latter the goal of every thought process. To the former He is the foundation, to the latter the crown of the edifice of every generalized world view. Natural science wants man to learn, religion wants him to act. Long and tedious reflection cannot enable us to shape our decisions and attitudes properly; only that definite and clear instruction which we gain can form a direct inner link to God. This instruction alone is able to give us the inner firmness and lasting peace of mind which must be regarded as the highest boon in life. And if we ascribe to God, in addition to His omnipotence and omniscience, also the attributes of goodness and love, recourse to Him produces an increased feeling of safety and happiness in the human being thirsting for solace. Against this conception not even the slightest objection can be raised from the point of natural science, for as we pointed it out before, questions of ethics are entirely outside of its realm. No matter where and how far we look, nowhere do we find a contradiction between religion and natural science. On the contrary, we find a complete concordance in the very points of decisive importance. Religion and natural science do not exclude each other, as many contemporaries of ours would believe or fear. They mutually supplement and condition each other. The most immediate proof of the compatibility of religion and natural science, even under the most thorough critical scrutiny, is the historical fact that the very greatest natural scientists of all times—men such as Kepler, Newton, Leibniz—were permeated by a most profound religious attitude. There is no particular mystery about mathematical analysis; its only distinguishing feature is that it is more trustworthy, more precise, and permits us to proceed farther and along safer lines. Consider, for example, the well-known change of colour from red to white displayed by the light radiated through an aperture made in a heated enclosure, as the temperature increases. From this elementary fact of observation Planck, thanks to mathematical analysis, was able to deduce the existence of light quanta and thence the possibility that all processes of change were discontinuous, and that a body could only rotate with definite speeds. Obviously, commonplace reasoning unaided by mathematics would never have led us even to suspect these extraordinary results. A. D'Abro, The Evolution of Scientific Thought from Newton to Einstein (1927) Foreword. Inasmuch as both Rayleigh's and Wien's laws of radiation, though incorrect, appear to express facts correctly at opposite limits of temperature and frequency, we may presume that the correct law must have an intermediary form, passing over into Rayleigh's when [temperature] T is large and [frequency] ν small, and into Wein's when the reverse situation... Planck, guided by these considerations, devised a new theory of radiation which he called the "Quantum Theory." From this theory Planck was able to derive a radiation law which satisfied Wien's relation, ...the displacement law [when the temperature is increased, intensities of all the frequencies increase, while the radiation of maximum intensity is directly proportional to the absolute temperature] and Stefan's law, and which was in excellent agreement with experimental measurements at all temperatures. A man to whom it has been given to bless the world with a great creative idea has no need for the praise of posterity. His very achievement has already conferred a higher boon upon him. It was Planck's law of radiation that yielded the first exact determination—independent of other assumptions—of the absolute magnitudes of atoms. More than that, he showed convincingly that in addition to the atomistic structure of matter there is a kind of atomistic structure to energy, governed by the universal constant h, which was introduced by Planck. This discovery became the basis of all twentieth-century research in physics and has almost entirely conditioned its development ever since. Without this discovery it would not have been possible to establish a workable theory of molecules and atoms and the energy processes that govern their transformations. Moreover, it has shattered the whole framework of classical mechanics and electrodynamics and set science a fresh task: that of finding a new conceptual basis for all of physics. It is clear, however, that the distinguishing mark of the whole development of theoretical chemistry and physics is the elimination of the anthropomorphic elements, especially specific sense-impressions, from the concepts. This process is called by Prof. M. Planck the objectification of the physical system. In early physical systems we have optics dealing with phenomena perceived by the eye; acoustics treating of auditory percepts, and so on. The subjective concepts of "tone" and "colour" have now been replaced by the objectified concepts of frequency of vibration; and wave-length. The object of this process of elimination is, according to Planck, the striving towards a unification of the whole theoretical system, so that it shall be equally significant for all intelligent beings. 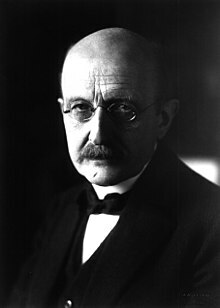 Planck ...devised his quanta theory, according to which the exchange of energy between the matter and the ether—or rather between ordinary matter and the small resonators whose vibrations furnish the light of incandescent matter—can take place only intermittently. A resonator can not gain energy or lose it in a continuous manner. It can not gain a fraction of a quantum; it must acquire a whole quantum or none at all. Planck was interested in physics, so he sought out the advice of Philipp von Jolly of the University of Munich, which he was to enter. Jolly... told Planck that "in this field, almost everything is already discovered, and all that remains is to fill a few unimportant holes." ...Planck replied that he didn't wish to discover new things, only to understand what was already known in the field. So by December 1900 Planck had changed everything in physics and chemistry. The only problem was he didn’t realize it. [...] Although he didn’t realize it, Planck had removed a foundation stone from the edifice of classical physics; it would take another twenty-five years for the entire structure to collapse. However, the immediate reaction was ... nothing. For the next five years neither Planck nor any of the great physicists of the era took up the meaning and extension of Planck’s ideas. Douglas A. Stone, Einstein and the Quantum: The Quest of the Valiant Swabian (2013), Chapter 1: "An Act of Desperation"
This page was last edited on 27 January 2019, at 11:11.